Yesterday, the Broken Lizard comedy troupe launched an IndieGogo campaign, seeking $2 million to make the long-awaited sequel Super Troopers 2. Just one day later, the campaign has reached the $2 million mark, which means that the sequel will go into production this summer. The Broken Lizard troupe released the following statement on their IndieGogo page just after passing the $2 million milestone. "You boys like Mexeeeco?? You girls like Mexeeeco??? Holy shitballs!! In just over 24 hours we hit the first milestone. If we could cry, we'd be crying. Thank you so much. Sincerely. We can make the skinny version of Super Troopers 2 but I think we all want the muscular version so let's keep going. Should we tell Farva?" 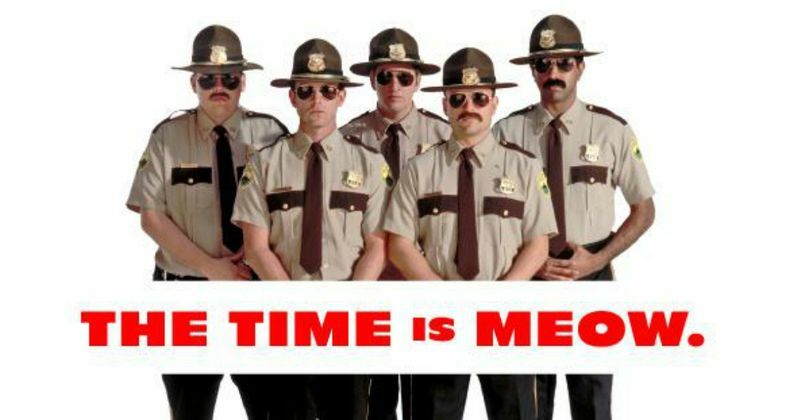 You may recall that the campaign was launched with a video featuring the entire Broken Lizard team (Jay Chandrasekhar, Erik Stolhanske, Steve Lemme, Kevin Heffernan, Paul Soter) back as their Super Troopers characters. At the end of the video, Farva (Kevin Heffernan) was locked in the trunk of his own car, with the rest of the team promising to let him out after the $2 million milestone was reached. However, as they explained yesterday, $2 million will only allow then to make a "barebones version" of Super Troopers 2, and the more money they raise means the movie will be even better. Fox Searchlight Pictures will distribute the sequel, although a specific release date has yet to be announced. Broken Lizard's latest update also stated that more perks will be added to the campaign later this afternoon. There is still 30 days left in the sequel's crowdfunding campaign, so we'll have to wait and see how much fans keep contributing to Super Troopers 2 after it has been fully funded. Take a look at the latest video below, along with tweets from the Broken Lizard members about surpassing the $2 million fundraising mark, and CLICK HERE to visit the project's IndieGogo page.